As a Korean adoptee (KAD), Nicky Sa-eun Schildkraut grew up in New England, a circumstance that inevitably prompted an early fascination with the diaspora that followed the Korean civil war. She observes that, accordingly, “many of my poems repeat and return to the themes of inarticulable loss, separation, and reimagination of the family and kinship.” As the title of this debut collection suggests, Schildkraut locates these themes in a formal expression oriented between refrain as song and refrain as restraint–”a nuanced method of expressing the equivocal and uncertain” that produces a tense flexibility in the look and feel of her poems. Schildkraut’s provocative and intensely lyrical poems seek to both unsettle and complicate presumptions about what binds people together in times of longing and loss. They do not draw solely on personal experience, but also tell the larger tale of the Korean diaspora–particularly the experiences of its women–in stories of war brides, defectors, birth mothers and other adoptees. 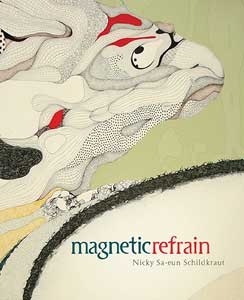 A copy of Magnetic Refrain is on reserve in the library under LIBRARY Ishibashi. The loan period is two days.